This is not an official letter from Save Our Spit Alliance; it is a personal letter from me as a reader of The Gold Coast Bulletin (GCB) and a member of the community. I recently read with interest a letter you sent to Crikey in response to the Des the Developer articles which were around some time ago. Well, to paraphrase you, I had promised myself not to write cranky responses every time one of your dodgy GCB articles has another 'go' at the Save Our Spit Alliance (SOSA). "...Hey, your poll shows we are big enough and ugly enough to take it." But like you, I've changed my mind. Your poll also shows that Gold Coasters do NOT want the terminal/ marina development on The Spit. Actually, SOSA has done a poll of sorts too- it's called a Petition - and right now we have over 22,000 signatures on it. I don't recall seeing that poll result being published in the GCB despite our recent press release? How odd that slipped by... perhaps you might mention it? But back to your most recent contribution Suzanne. You report that 52% of those surveyed in the three Labor electorates you chose to survey, opposed the development, 60% against in Broadwater. Whatever one thinks of the poll outcome - your response is to attribute confusion generated somehow by an indicative picture SOSA produced a long time ago. That's very long term confusion... and made all the more surprising as the GCB published its own depiction which ironically was more inaccurate than that which you attacked. 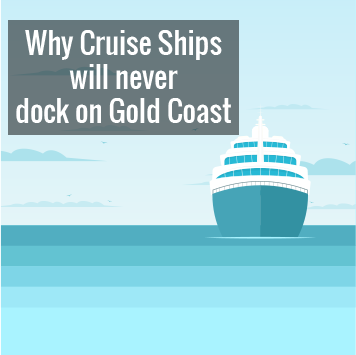 And on the smoke thing - yes - overseas research shows cruise ship air pollution per day to be the equivalent of 12,000 vehicles. So there IS smoke. Either way, the suggestion that either picture- yours or ours- generated confusion sufficient to account for the poll result is just silly. Back to your Crikey note, you also wrote that you fear that Crikey "... is being used by someone angry at our unrelenting scrutiny of the local council... That is our job. Believe it or not, there are no ulterior motives. If something looks askew we report it..."
All sounds fair enough to me. So why then do I feel I could use that very same argument against the GCB at the moment. Why has the GCB has taken an approach apparently based upon ridicule, with the objective of opposing or failing to sensibly report anything that SOSA has to say? And why does the GCB deride SOSA as a "bunch or greenies", "hanky-wringers" or most odd, "hysterical fanatics"? Rather curious but no doubt, no ulterior motives. Further, there are numerous stories here of things wildly 'askew' which the GCB owes it to its readers to report upon, but you are missing them all. I am very happy to talk to you about this further if you are interested. 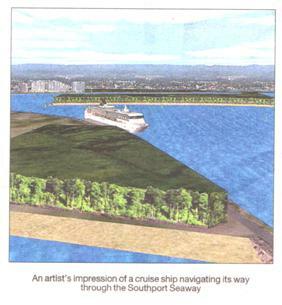 The image is one printed in the Gold Coast Bulletin in support of the Shipping Terminal. Just where is the terminal ?